Poole lifeboat was launched at 5.30pm on 8 September by UK Coastguard to aid a 46ft yacht with seven people aboard, which had collided with the chain ferry that runs between Poole and Studland. 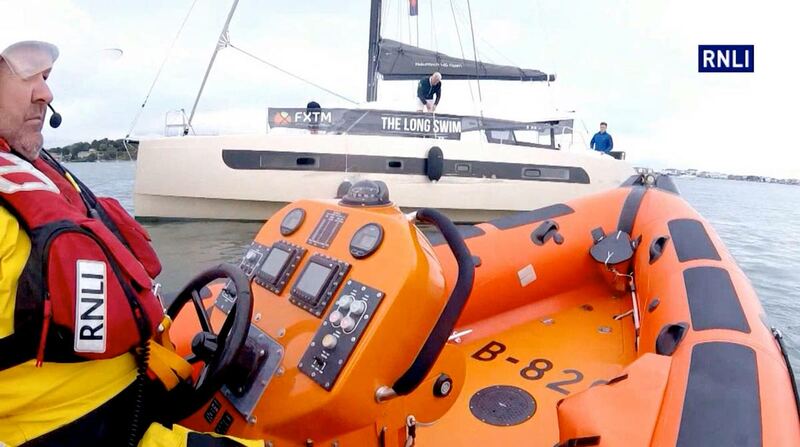 Launched within minutes, the lifeboat crew found the double-hulled catamaran drifting down the channel inside the harbour. It had sustained extensive damage down its port side, and its port keel had broken off and was floating nearby. It was the second time someone had collided with the chain ferry within the last few weeks. There was a strong flood tide and a south westerly breeze in the harbour. Two lifeboat volunteers were transferred on-board the stricken vessel, to check that the occupants were okay. Although the damage to the yacht was extensive, there was no water ingress. The vessel was towed to the quay and taken into Poole Quay Boat Haven. RNLI volunteer helm Jonathan Clark said, “This is the second vessel that has collided with the ferry that we have launched to in recent weeks. Once more the strong flood tide has caught them out, thankfully this time, nobody was injured and hopefully the yacht can be repaired. The combination of the tides, the narrow entrance to the harbour and the chain ferry make this an extremely hazardous area. A Poole Harbour Commisioners’ vessel located the port keel and towed it to the quay as it was semi-submerged it could have been a hazard to navigation.